Looking for a gift for someone special? If so, we may have just the thing for you. A Wassledine gift certificate can be purchased for various amounts and remains valid for a year so the recipient will have plenty of time to decide how they would like to spend it. 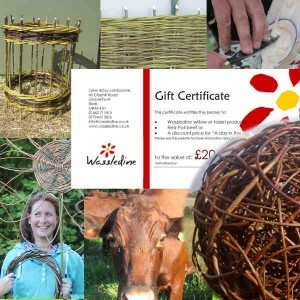 Gift certificates can be redeemed against our ‘day in the woods’ courses in Bottoms’ Corner, from the spring to autumn, our succulent Red Poll beef or any of our lovely willow and hazel products so if your special person might enjoy a day of serious relaxation in our lovely wood, is a gardener in need of something very special for their patch of heaven or a gourmand who would appreciate some great beef, look no further. Simply tell us how much you’d like to spend, where you’d like the certificate sent and whether it should be on paper or as a pdf, sent to an email address. Please complete the form below and press submit. This will take you to Paypal where you will be able to pay using your own Paypal account or by pressing the ‘checkout as a guest’ button, you can use your own debit or credit card – simple. If you would prefer to pay using a bank transfer, just send an email and we will send our bank details. Please note: We will charge £2.50 for emails or £4 for postage, in addition to the amount of your gift, to cover the cost of administration. Certificates will be made out to a named person, so please ensure you supply a name if it’s not to be your own. The original paper certificate must be surrendered when the order or purchase of goods is made. When redeeming the certificate, products and courses will need to be ordered or booked in advance. Some of our products can be sent by post but the cost of postage will be added to the purchase price of the goods ordered. No change will be given for purchases of a value less than that of the gift certificate. Please allow 5 working days for delivery of the certificate by post or 2 days for an electronic version.